In the spirit of building cultural connections, Wilfrid Laurier University students had the opportunity to share in Haudenosaunee teachings at a special event at Everlasting Tree School in Six Nations of the Grand River Territory. 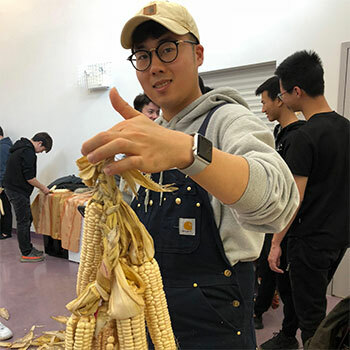 Laurier’s Office of Indigenous Initiatives and Laurier International hosted the event to foster relationships and build understanding between international students and the local Indigenous community. During the event, students participated in the harvest of white corn, learned to braid corn, listened to creation stories and shared a meal. Whitlow said being able to host the students and provide examples of Haudenosaunee hospitality was a good way to build relationships with one another. For many of the students, this was the first time participating in an event of this nature. Fourth-year Digital Media and Journalism student May Xu was grateful for the experience to learn about a new culture. “Canadian Indigenous culture is an inalienable part of Canadian culture, but it can be difficult for me to find a way to experience it,” she said. Xu noted she learned that many of the celebrations were tied to being grateful for the land and what it provides, especially during the harvest.